Maxflash Action Hyperspeed microSD cards are excellent memory upgrade for action cameras(GoPro, Drift, Contour, etc. ), smart phones, tablet computers, MP3/MP4 players and many other applications. With its small size, low power consumption and capacity to 32GB, they are the ideal storage medium for your data such as music, movies, ringtones. 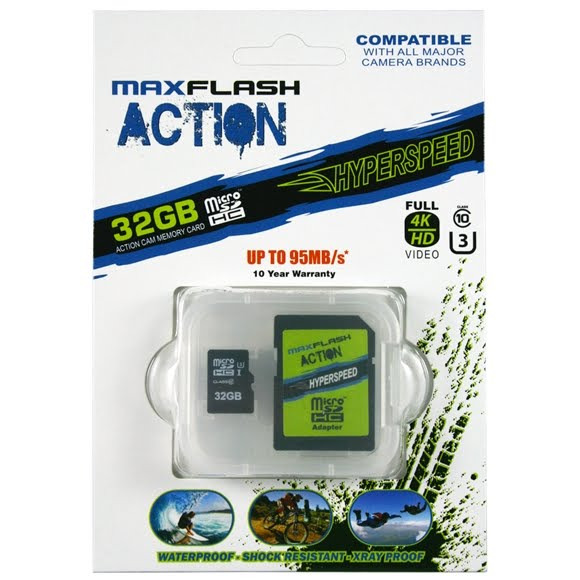 Maxflash Action Hyperspeed microSD cards are excellent memory upgrade for action cameras(GoPro, Drift, Contour, etc. ), smart phones, tablet computers, MP3/MP4 players and many other applications. With its small size, low power consumption and capacity to 32GB, they are the ideal storage medium for your data such as music, movies, ringtones. The included SD adapter extended the application range to many other options, such as digital cameras, etc., even if no microSD card slot is available.